I hope you all had nice relaxing weekends! We actually saw some sun this weekend, so I spent my time at the beach rather than in front of my sewing machine as I had planned. I didn’t touch my 9 patch quilt at all, though I did buy a solid backing for it, so now I have no excuse! It’s made up of strips of lovely oranges, blues and browns, plus the fabulous Heather Ross goldfish prints. And the binding is a brown polka dot from the Momo Wonderland line. It really looks splendid with the solid backing, if I do say so myself! This one measures about 37″ x 44″ and is now for sale in the shop! This entry was posted in [search] Strip Quilts, 2009 Finished Quilts, Finished Quilts, Posts about Quilts, Quilts and tagged baby quilt, goldfish, handmade, Heather Ross, lightning bugs stripe, quilt, quilting. Bookmark the permalink. You kill me! That is so darn cute and perfect for a little boy or girl! I’m so happy to see you are parting with some of your stuff (I’m sure some buyers are happy too)! That is so cute! I have those goldfish fabrics too and made my daughter a shirt over a year ago (that didn’t even end up fitting!). 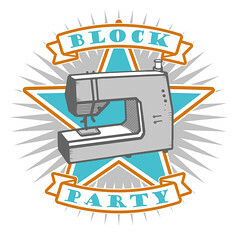 Maybe I’ll need to break out my scraps! You have such a great eye for color. 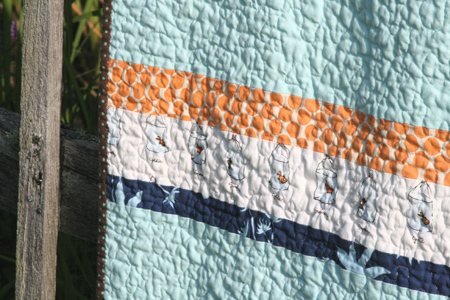 Absolutely adorable, a perfect baby quilt. Nice to have something gender-neutral / boy-friendly that isn’t overtly CARS! TRUCKS! BOY THINGS! Know what I mean? 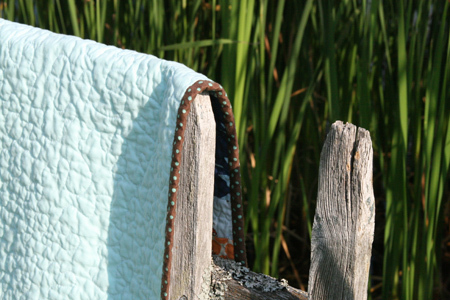 I agree, that brown polka dot binding is really perfect with the solid backing. Great colors! Feels like you’re underwater or in the fishbowl, yourself! I LOVE the polka-dot binding. That quilt looks so cozy for some reason! Nice work, lady! Again, great job! And again, where fo you find time for all those quilts??? 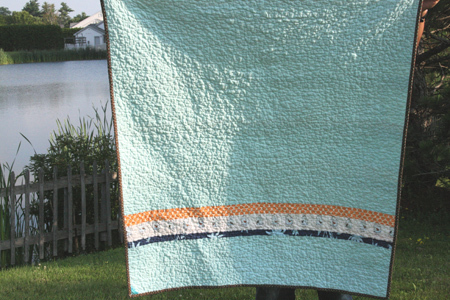 I’ve did the math….7 mo X 4 wks = 28 weeks and you have 25 quilts FINISHED! One you turned one quilt into 4 small ones, thats about 1 quilt per week. Keep up the GREAT work….you give me and others inspiration to make all things cute! That is just beautiful! I love the way you put fabric together- the color choices, the placement, just about everything. Awesome little quilt! could you be any more fabulous?!! 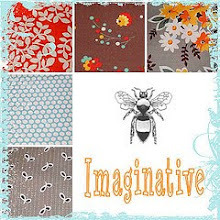 I can’t wait to get my fabric–did you sprinkle a little creative dust on it before you sent it in the post? 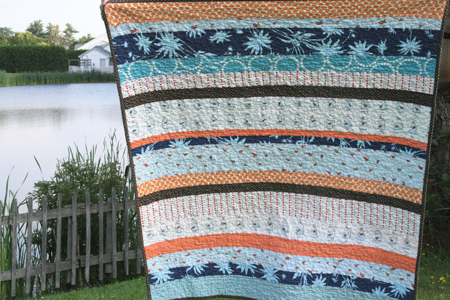 Love the simple stripes, especially the goldfish fabric! ADORABLE!!!! I LOVE the goldfish fabric. It is soooo cute. It was great to see some sun, though you didnt finish the quilt. I love how you take a simple line and turn it into such beauty! LOVE!! The colours are just gorgeous together! Love the fabrics too!! I am in love with this quilt! What a gorgeous color combo!! Ooh! I have that blue Joel Dewberry fabric. 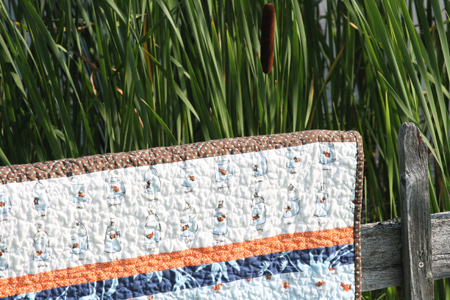 I used it on a rocking chair redo, and now I’ve used 7″ squares of it on a quilt. I like the stripes of it too! I’m running out, I’ll have to buy more. LOVE this quilt!